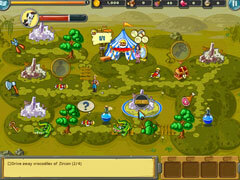 Experience awesome time management fun with a kicking fantasy twist! Outta This Kingdom combines awesome time management fun with a kicking fantasy twist to create casual gameplay the whole family will love! When the beautiful Rachel and her wise-cracking cat unwittingly cross a dimensional rift and wind up in a colorful world teeming with magic, she joins forces with the handsome Jake to return home. To find the wizard who can send them back to their own dimension, they must complete an epic journey across many stunning environments, rebuilding a kingdom warring factions tore apart. 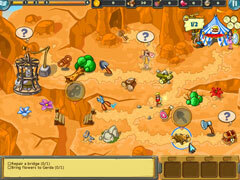 Collect resources, build and upgrade villages and hire workers to complete these and other tasks. 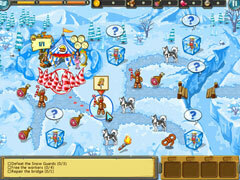 Along the way, you'll defeat Land Elementals, outsmart an Ice Queen and go toe-to-toe with Gingerbread Barbarians! Will you join Rachel and Jake on their grand adventure?